This visit to Kopi Aroma store and also factory was done around year ago, when I was one of the home committee of Asian Conference on Environmental Behavior Studies (AcE-Bs) in Savoy Homann, Bandung. The visit was included as a part of our city tour program that was being held after the conference was done. Actually, the group of participants were not straight coming to Kopi Aroma, but we stopped our bus on Jl. Braga and then take a walk around the area behind the commercial building in Braga which was considered as one of the slum area in Bandung because of their density and sprawled buildings. So, we walked through the narrow streets between buildings in Kampong Braga until we reached the Kopi Aroma, which was located on Jl. Banceuy. Mostly the participants of this city tour were Malaysian, so they quite surprise what they found along the way in Kampong Braga, because they didn't have that kind of settlement area in Malaysia. As we found at our visit to Kuala Lumpur, the city was planned well by their government, not like ours. 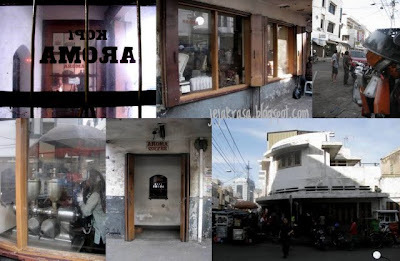 When we arrived at the Kopi Aroma around 9 am, the store was still closed and Jl. Banceuy wasn't hectic like usual, because all the store was still closed and also the street vendors weren't there yet. 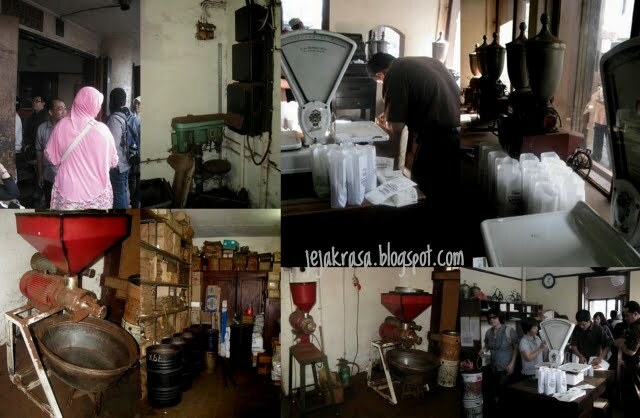 For taking the group to Kopi Aroma we have to make appointment first with the owner or someone responsible with the shop and they told us that they weren't allowed the whole group entering the factory at the same time but we divided into group of ten peoples. We saw that even before the shop is opened, there were already many peoples waiting in front of the store, I think to buy the coffee, maybe they were re-seller or something. Actually, we can find Kopi Aroma in supermarket like Griya/Yogya and Setiabudi Market in Bandung, but in Jakarta you can find it in Food Hall Supermarket, but of course the price is more expensive. The store and factory was quite old, have the kind of vintage atmosphere, even the tools they have were so old, but I think that what made the store and factory interesting. 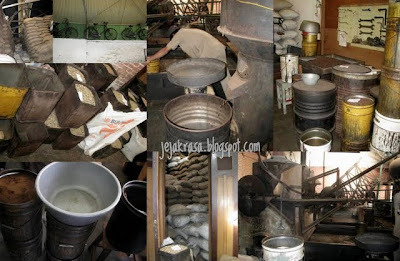 As I entered the factory area, I could see how the coffee beans being stored and roasted. After that the group were lining up to buy the coffee for souvenir. Someone even said that actually she didn't like drinking coffee but the good smell of the coffee made her bought it. So, coffee fans? You should go to Kopi Aroma, but better go there in the morning when the area still quiet and not crowded.